Wagon features include large storage capacity, with seats which flip into a flat bed, seat or table; 6 cup/snack holders; easy-pull handle and easy-access door. 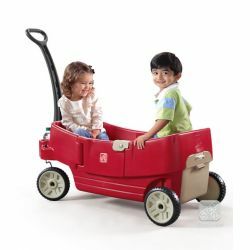 Whisper Wheels™ allow for smooth, quiet ride. Assembly required. Ages 2 and up.